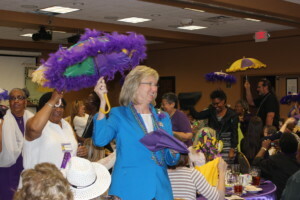 The women of the LWML Louisiana-Mississippi District convened in Houma, LA, for their 38th biennial convention on April 22-24. 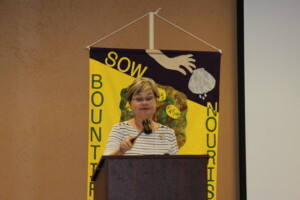 They met under the theme of “Bountiful – Sow, Nourish, Reap.” Convention participants engaged in a service event of making fleece tied blankets, worship and Bible study based on the convention theme, business sessions, and fellowship. The ladies also shared gifts from their hearts – fabric kits and food. The LA/MS District was honored to have President Patti Ross as their special guest and representative from the National Executive Board. 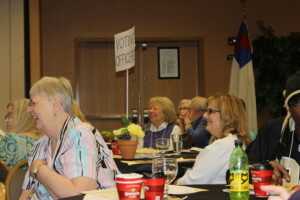 Convention business included adopting a $55,000.00 mission grant goal for the 2016-2017 biennium, as well as adopting seven mission grants to receive funding. Delegates also elected new members to the LA/MS District Executive Board: Anita Granger (President); Linda Turner (Vice President of Mission Grants); Rita Salathe (Vice President of Christian Life); Gilda Dominigue (Secretary); Andrea Ferguson, Laura Lips, and Delores Stringfellow (Nominating Committee). A banquet on Saturday evening featured music by the choir from Concordia College Alabama. These fine musicians shared their amazing God-given gifts during an uplifting performance. The convention was an inspiring and uplifting weekend, whereby attendees were refreshed and renewed for service to Christ.